Doesn’t it always seem as if all the exciting stuff is happening in Europe? 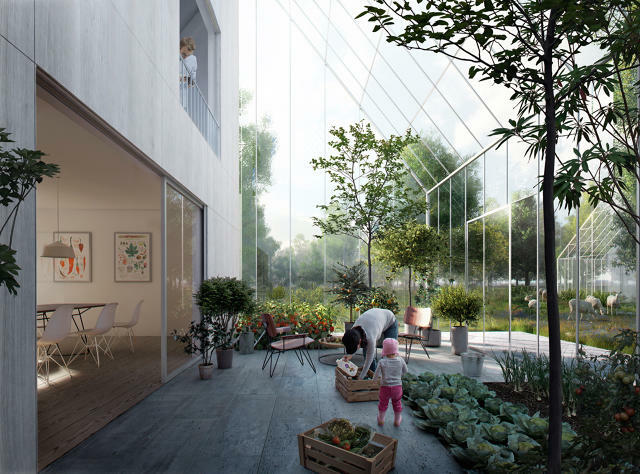 Well, check this out: a new neighborhood is being built in an Amsterdam suburb to be the first ReGen Village, where the homes are designed- actually the entire community is designed- to be fully self-sufficient, growing its own food, making its own energy, and handling its own waste in a closed loop. The village will be located on the outskirts of Almere, a quickly growing town 20 minutes by train from Amsterdam, and will grow about half of the food they eat— excluding coffee or bananas, for instance (although the company believes in some locations, the neighborhood could actually be fully self-sufficient). The community will also feed energy back to the local grid. While they plan to expand everywhere, they currently have planned projects in Sweden, Norway, Denmark, and Germany. They would even like to adapt the system for arid climates such as the Middle East. “By using the most advanced methods for growing food—a combination of aeroponics, aquaponics, permaculture, food forests, and high-yield organic farming—the neighborhood will grow many times more food than a traditional farm of the same size, with fewer resources. Aquaponics, for example, can produce 10 times as much produce on the same amount of land, with 90% less water. James Ehrlich, CEO of RenGen Villages, anticipates tons of “abundant, organic food” (vegetables, fruit, nuts, legumes, fish, eggs, chicken, small animal dairy and protein) every year from the community. In fact, in order to supplement their seasonal gardens they will use vertical garden systems all year long. The Danish architecture firm, Effekt, helped them on the design. They will produce their own energy by using a mixture of geothermal, solar, solar thermal, wind, and biomass. Ehrlich says they are even looking at certain technologies for small-footprint biomass that use farm waste and turn it into a consistent energy source- even in the dead of winter. A smart grid will distribute power efficiently throughout the community, sending it to a carport to charge shared electric cars as needed. There is a biogas plant planned that will turn any non-compostable household waste into power and water and their water storage system will collect rainwater and graywater to redistribute it to seasonal gardens and the aquaponic system. Ehrlich says, “We’re really looking at a global scale. We are redefining residential real-estate development by creating these regenerative neighborhoods, looking at first these greenfield pieces of farmland where we can produce more organic food, more clean water, more clean energy, and mitigate more waste than if we just left that land to grow organic food or do permaculture there,” reports Fast Coexist. The community in Almere will break ground this summer and is slated to be finished in 2017! This is exciting. I would LOVE to have one of these communities show up here in the states. What about you? Would you live in a community like this?